Savor The Days: Free Children's Book at Half Price Books! If you've read my blog for a while you know that I love books. This is a passion that I think is important to pass down to my children. So since they were infants I've always had books for them. Books can be found in almost every room in our home. Each of our children have a hundred books in their room....although I think I counted over 300 books in Nicholas' room last year. Rachel loves to just look at pictures and make up stories out loud. Nicholas can spend an hour or two a day just reading quietly to himself. The skill of reading obviously helps kids do well in school and throughout adulthood. But reading also teaches them about the things and places they read about. Even fiction books help them learn about being creative and opens up their imaginations to new ideas. I love to scour used book sales at libraries but I also enjoy hunting for books at Half Price Books where I can find great quality used books for half the price of new. There are several Half Price Books locations in the DFW area and I can always find a good deal on great books. So I was especially excited to hear about the Half Price Books' Booksgiving Day Celebration this weekend! To encourage children to read, Half Price Book is giving books away this Saturday! Every child that attends will receive a free book to take home! If you don't have kids, you can still pick up a children's book for free and share it with a special child you may know. 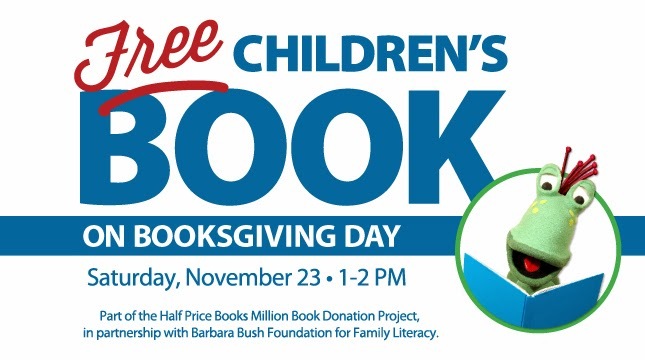 So be sure to stop by your local Half Price Books store on Saturday, November 23rd from 1:00 - 2:00 to pick up a free children's book! For more information on literacy, please check out the Barbara Bush Foundation for Family Literacy.